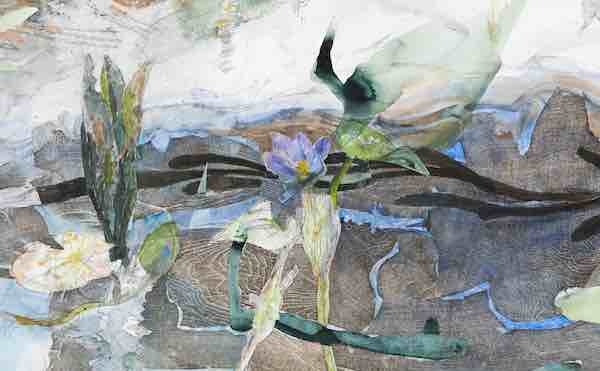 John Wolseley, The life of inland waters – Durabudboi River (detail), 2015-18. Watercolour, graphite, woodcut on paper, 124 x 445cm. Courtesy: the artist and Roslyn Oxley9 Gallery, Sydney. Roslyn Oxley9 Gallery presents a solo exhibition of new works on paper and sculptures by John Wolseley. Wolseley is one of Australia’s most important artists. He portrays the Australian landscape and its ecosystems by combining collage elements and markings made in collaboration with the natural environment. These works celebrate the beauty of the Australian wilderness and encourage and an understanding of the significance and environmental fragility of these remote and little-known sites.